Looking for a new, fantastic piece of art to adorn your walls? You won’t want to miss POP AUSTIN International Art Show in Austin October 22 through October 25 — the same weekend as the United States Grand Prix Formula One Weekend. Hundreds of thousands of international thrill seekers will descend upon the hippest little city in America for the world’s premier racing event and the world’s newest art happening. It will be a spectacular weekend to see and be seen. Featuring some of the most popular stars of contemporary art, as well as a specially selected group of local artists, POP AUSTIN offers some of the coolest contemporary art in the world – worthy investment pieces for a growing collection; art that can represent your hip, worldly style. Last year’s inaugural POP AUSTIN hit the global art scene with style, boasting artists from across the globe including Takashi Murakami, Gao Brothers, Gérard Rancinan, Mr. Brainwash and Massimo Vitali. 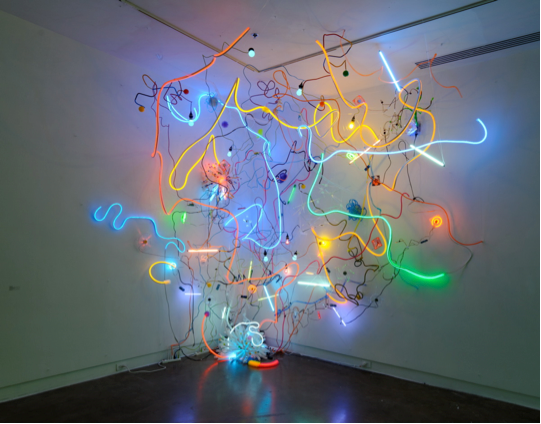 Now in its second year, POP AUSTIN 2015 will feature a thematically curated show, ILLUMINATION, an international survey of light-based art. Alongside some truly stunning light art installations, this year’s exhibition will include work by artists including: Carlo Bernardini, Claudia Meyer, Hans Kotter, Jeongmoon Choi, Lisa Schulte, Lori Hersberger, Matthew LaPenta, Nonotak, and local artists Adela Andea (Houston), Alyssa Taylor Wendt (Austin), Bale Creek Allen (Austin), Evan Voyles (Austin), Jerome Morrison (Austin), Sharon Keshishian (Austin), and Todd Sanders (Austin).